Judith Leyster's whole, "Oh hi, I didn't see you come in," act is a front. Don't be fooled. The come hither gaze is meant to get your business. There's eighteen paintbrushes in one hand, because she's just that good, and nothing but confidence and skill in the other. She's even dressed to impress. That get-up isn't practical painting gear. The palette isn't even visible below that giant-squid-eyeball sized collar. The ensemble's supposed to make the viewer think, 'Wow, that's a classy lady. I bet she paints real purdy like.' And yeah, she does. The grinning violinist on the canvas within the canvas was originally a self-portrait of Leyster within the self-portrait. The nception angle was abandoned pretty early in the process, which can be seen if you shoot x-rays at the painting. The violinist Leyster portrayed was no random choice, either. He's one of the characters from Merry Company, a genre scene of happy-go-lucky musicians that happened to be one of Leyster's most popular prints. She was selling copies of Merry Company constantly, and showing off that guy here allowed her to advertise one of her best-sellers and shove her success in everyone's face in one fell swoop. Even though Leyster's well-recognized today as an immense talent, both artistically and as a businessperson, it's only since about 1900 that her works are even attributed correctly. For 250 years after her death, most of her paintings were attributed to Haarlem big shot Frans Hals. Even this self-portrait was credited to Hals as recently as the early 1900s. Art auctions from the time advertise the work as a piece by Hals of his daughter at an easel. Because despite being an amazing artist, the world still sees her as good...for a girl. Self-portrait by Judith Leyster is an oil painting in the collection of the National Gallery of Art that was offered in 1633 as a masterpiece to the Haarlem Guild of St. Luke. It was attributed for centuries to Frans Hals and was only properly attributed to Judith Leyster upon acquisition by the museum in 1949. In 2016 a second self-portrait was found, dating from around 1653. Continuing in the tradition of 16th-century artists who pushed to have painting seen as a profession as opposed to a craft, Leyster chose to depict herself wearing lace cuffs, rich fabric and a huge collar, which would not have been suitable for painting, but draw attention to her wealth and success. In doing this she both distinguished herself from less skilled artisans and showcased her technical abilities. While it is unclear whether Leyster studied under Hals the loose brush strokes and casual pose echo his stylistic choices. Similar to other paintings of hers Leyster's self-portrait has a momentary quality to it—she is turned partially to the viewer with her lips parted as if to speak. This, along with the fistful of brushes and inclusion of the fiddler from her later painting The Merry Trio, suggest that this piece was calculated to advertise her abilities. 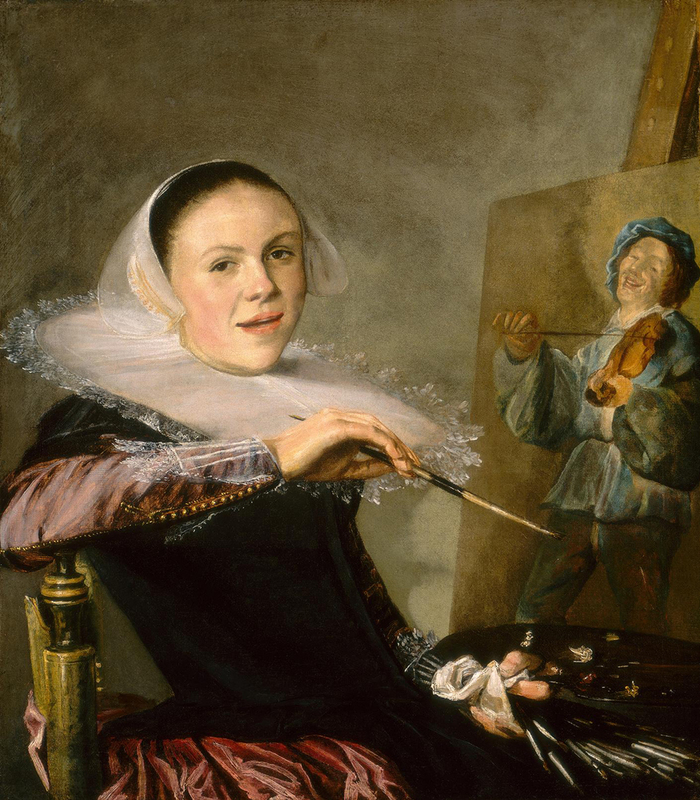 Check out the full Wikipedia article about Self-portrait by Judith Leyster.